A ‘light bulb’ moment led us down a path of development we had never ventured before. Platinum Electrical Engineering were involved in the periphery, of a large scale project, which was currently in the down-selection phase, and working towards a final contract award for our client. In attendance of a two day event for both corporate and engineering teams, representing the Royal Navy and the Aircraft Carrier alliance, was our Technical Director. The story goes… he was seated at the rearmost part of the presentation, in the event there would be questions about machinery. He recalls a sudden realisation of the sheer scale of the project and what was expected to be achieved, in what seemed like a very short time. At this point some machinery had already been trialed for the task; successfully, but it was becoming apparent that it would not ‘scale-up’ to project demands. We are both privilege and honored to have worked with some of the World’s leading experts within the surface engineering industry, in the delivery of this project. Challenges: There was no text book to refer to, no prior art, and most certainly plenty of rules and limitations. The process is a tried and tested method for the application of Thermal metal spray onto steel plates, in specialist facilities set up for just that, or manual application methods for site based applications. A tight timescale for the project delivery made sure we where tested to capacity to deliver the finished machine. Vast amounts of time ‘on ship’ followed, with the need for understanding and absorbing potential pitfalls and limitations of working on the nations flagship. The machine itself had to be designed with a full gambit of requirements ranging from having the ability to drive from one side of a ship deck to the other using generated power to having the ability to interface with third party equipment to deliver a multi layered additive manufacturing process accurate to 400 microns with both assured repeatability and reliability. 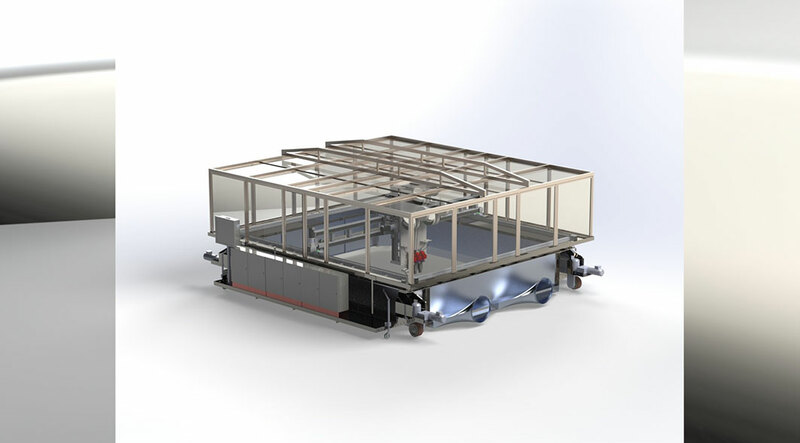 The machine needed to be designed from the ground up (literally), the largest in the current range is 7.5m x 7.5m x 3.6m with a work envelope of 20 SqM. The most demanding of all of the challenges was to look back at the design and figure out how we could disassemble the whole thing and package it into 20ft ISO containers for storage, delivery and rapid deployment. How the Product Helped: The UMC1, was the first of 3 machines provided between 2015 and 2017 for the QEC class program. The first incarnation of the machine made the project feasible within a demanding timescale, whilst delivering on the standards and requirements from the client for the operational requirements of the new F35 series fastjet. Without the specialist nature of the machine, the project would have required multiples (10-15) of the initial adapted machinery tested during the down selection program. Which would have yielded a much higher cost and the need for increased operational personnel. 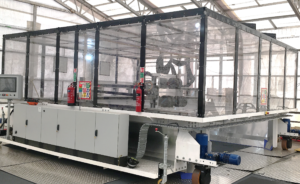 As additional surface area was added to the project by the client , the need for a second machine was apparent , we updated the original design with larger robotics and comparable overall footprint to give and extra 6m2 working envelope. 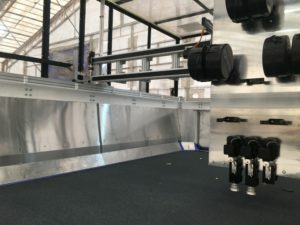 Results, Return on Investment and Future Plans: The machinery delivered exactly as required, passing all validation tests during initial trials and when built up ready for production. The UMC range is now mission proven at technology readiness level 9. We have demonstrated the machines versatility to be stored for extended periods and re assembled for production at short notice, whilst still performing as expected. The patent for the UMC has now been granted. Meaning one machine can now carry out pre and post coating tasks. Work has also commenced on an IIOT strategy for rolling out as the fleet expands. This will give clients added value to the processing by providing vital analytics in real time, fed back to the main plants for analysis and production studies. Alongside, monitoring and prescriptive maintenance to be carried out wherever on the planet the equipment is in use. If you have had a similar problem within your business and would like to reach out to see how we can help, please contact us via the the form below.